LaserAway is an Arizona premier medical spa specializing in laser tattoo removal, laser hair removal and anti-aging procedures. Since LaserAway’s 2006 California debut, Hollywood celebrities have raved about its state-of-the-art laser hair removal procedures. Now Arizona residents can experience the magic of LaserAway’s premier laser hair removal, tattoo removal and anti-aging treatments. We at LaserAway understand how difficult it can be to choose among medical spa treatments. That’s why first-time clients can take advantage of a free, no obligation consultation. Our expert medical staff will happily explain the finer points of laser hair removal, tattoo removal, anti-aging procedures, or any of the other treatments we offer at our Arizona locations. Curious about Thermage? LaserAway can help. Eager to try VelaShape? No problem. Want to experience Clear + Brilliant? 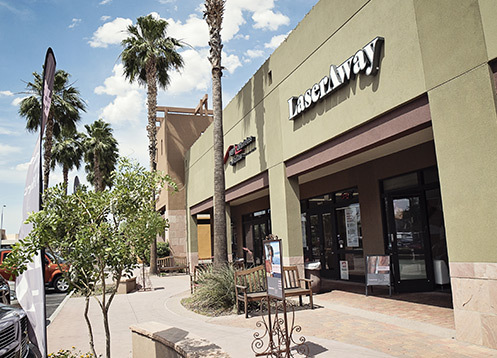 Come on down and visit Arizona premier medical spa, LaserAway.